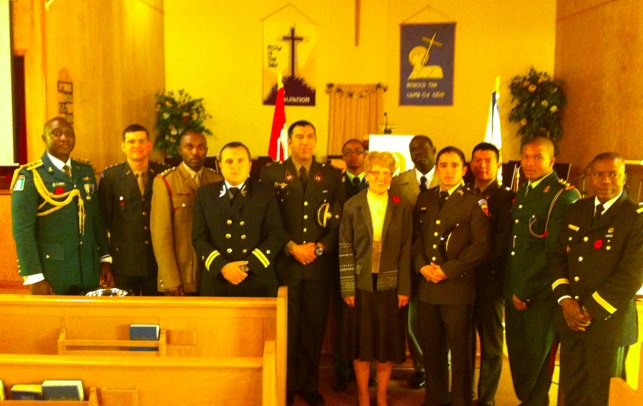 Pastor Thelma McLeod taking a moment for a photo with members of the International Students of the Junior Commander Staff Course at Camp Aldershot, who agreed to march in the flags for our Remembrance Day Service, Sunday November 6th, 2011. Some of the nations include; Nigeria, Kenya, Peru, Venezuela and Brazil, among others. We at Bethany extend a sincere thanks to these men, for taking part in our Remembrance Day Service, and for being part of our community while here for their training.